Moerstraat 23, 8000 Brujas, Belgica. 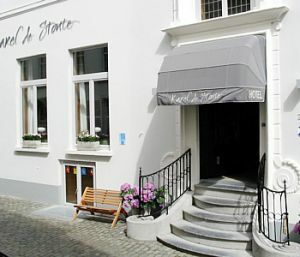 Hotel 'Karel de Stoute' is a charming, peaceful 3-star family-run hotel situated in the historic heart of Brujas. It is the original 15th century city-palace of the Dukes of Burgundy in Brujas. The hotel dates back to before 1400 with the authentic structure and elements from the Burgundian time still in place. The hotel is on the Flemish Heritage List due to its unique historical value and used to be in the garden of the Prinsenhof-site in Brujas. 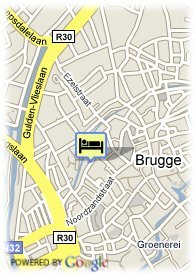 This hidden medieval gem of Brujas lies just off the main squares but is situated in a quiet neighbourhood. Today it is known for its hospitality and personal attention to the guests. Proximidad a la estación, Parque, Centro ciudad, Zona de museos, Proximidad al casco antiguo, Centro comercial. Menos de 2 dia(s) antes de la llegada: se debera abonar la reserva completa.